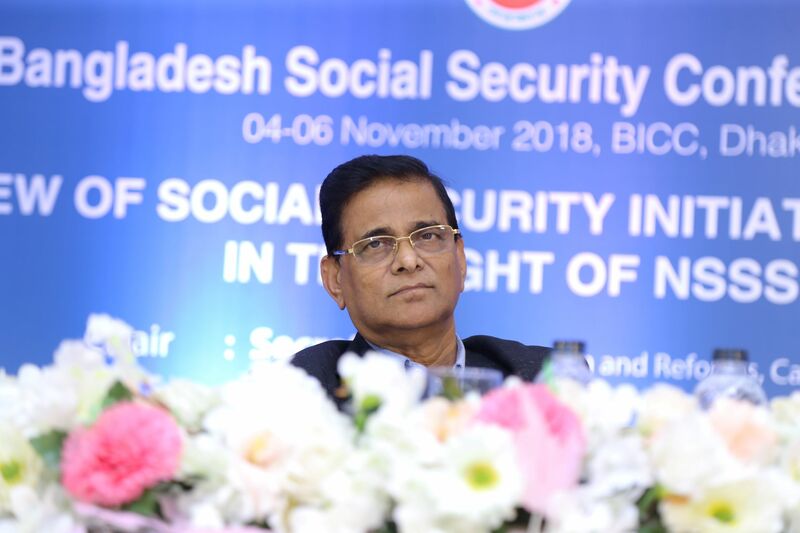 Social security is mandated by the Constitution of Bangladesh, with Article 15 (d) obligating the State to secure the right to social security for its citizens. 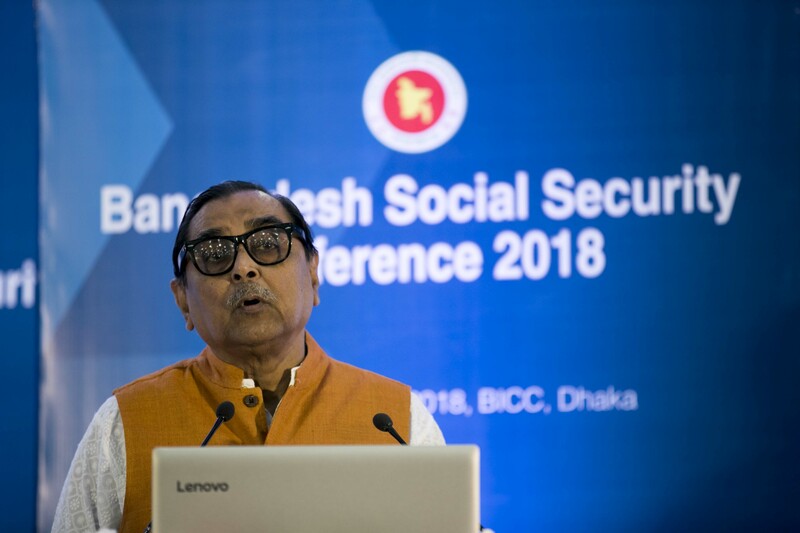 Moreover, with commitment for reducing poverty and inequality and establishing social justice, the government formulated the National Social Security Strategy (NSSS) of Bangladesh in 2015. The strategy is a long-term road map up to 2026 for introducing a lifecycle based comprehensive social protection system in the country. 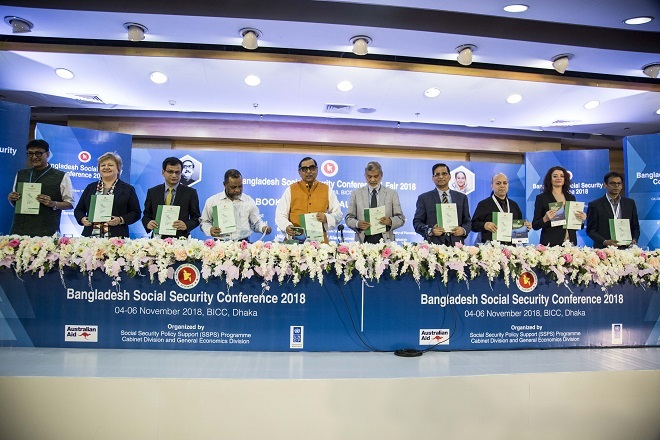 After elaborate consultation with 35 line ministries, the Cabinet Division formulated the Action Plan - Implementation of the National Social Security Strategy (NSSS) of Bangladesh - 2016 – 2021 which was formally unwrapped on 4 November 2018 in the inaugural ceremony of Bangladesh Social Security Conference and Fair 2018 which continued till 06 November 2018 at the Bangabandhu International Conference Center (BICC). Two more publications such as the Background Research Papers for Preparing the National Social Security Strategy of Bangladesh and ABCD of Social Protection in Bangladesh were also unveiled in this occasion. 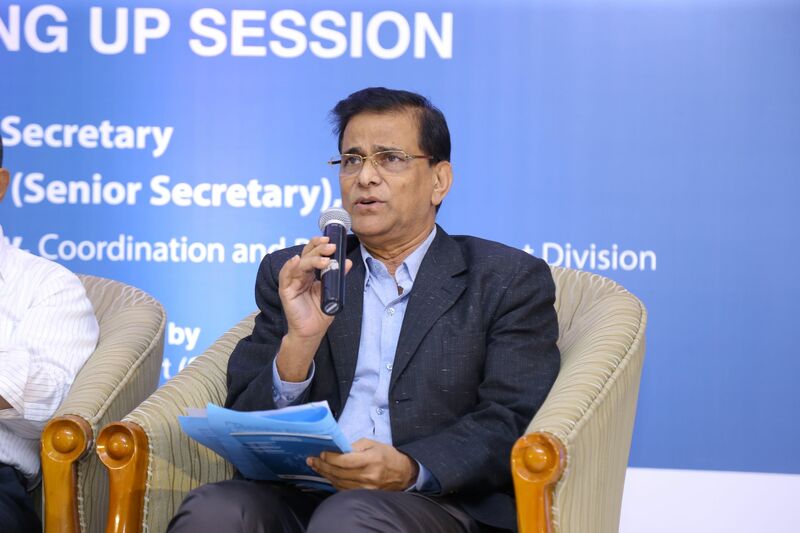 The conference was organized by Cabinet Division with technical support from the Social Security Policy Support (SSPS) Programme which is a joint project of Cabinet Division and the General Economics Division with funds from UNDP, DFID and DFAT (AusAid). Hon’ble Social Welfare Minister Mr. Rashed Khan Menon and Hon’ble State Minister for Ministry of Finance and Ministry of Planning Mr. M. A. Mannan were the chief guests. Chaired by the Cabinet Secretary, Mr. Mohammad Shafiul Alam, the programme was attended among others by H.E. 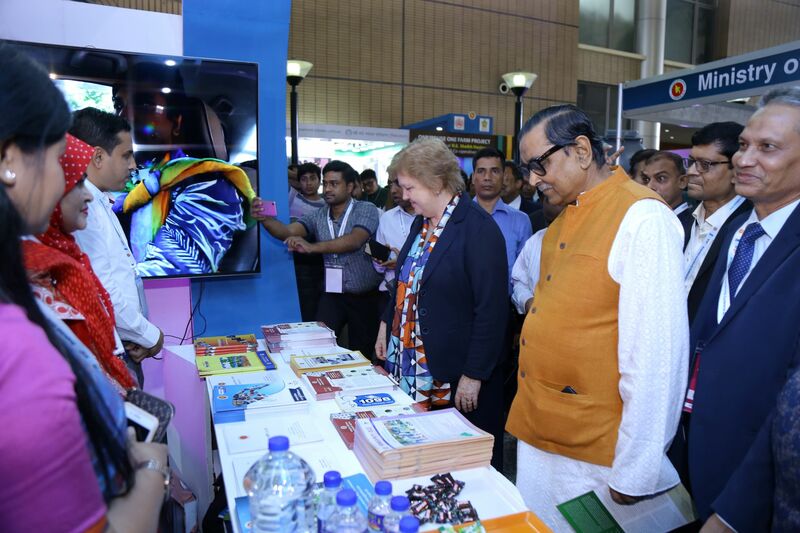 Ms. Julia Niblett, Australian High Commissioner in Bangladesh, Mr. Sudipto Mukerjee, Country Director, UNDP Bangladesh and Dr. Simone Field, UK Represenative of Bangladesh. 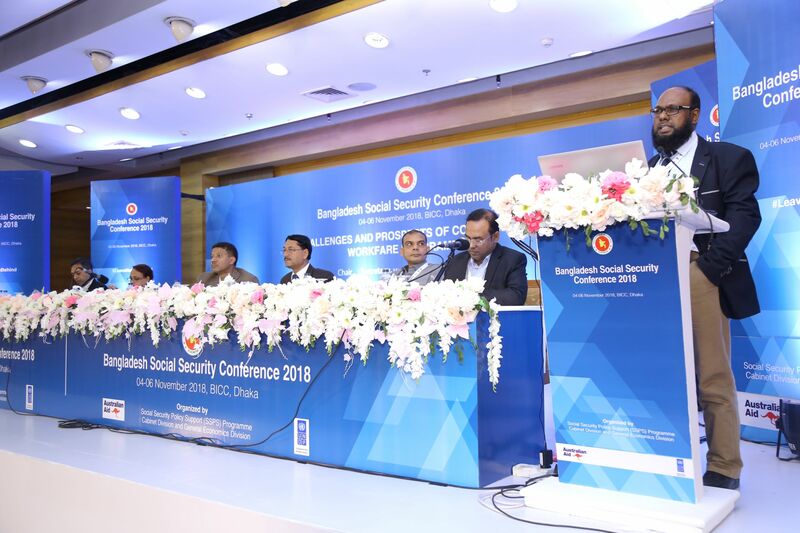 The general objectives of the conference was to review the social protection programmes of different ministries and to enhance collaboration between government and non-government organizations in implementing the NSSS and to showcase the social protection initiatives of the government. 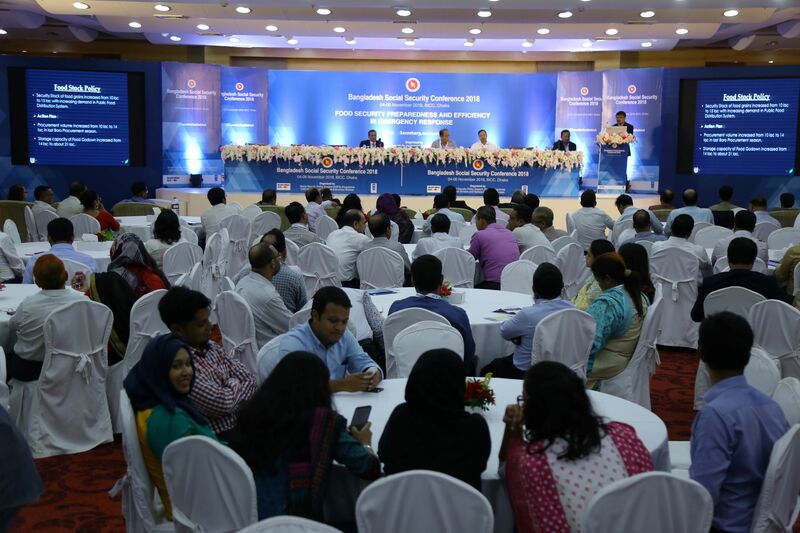 The inaugural ceremony was attended by more than three hundred participants including senior officials from 35 ministries, representatives of 16 NGOs, 4 mobile banking companies and development partners. 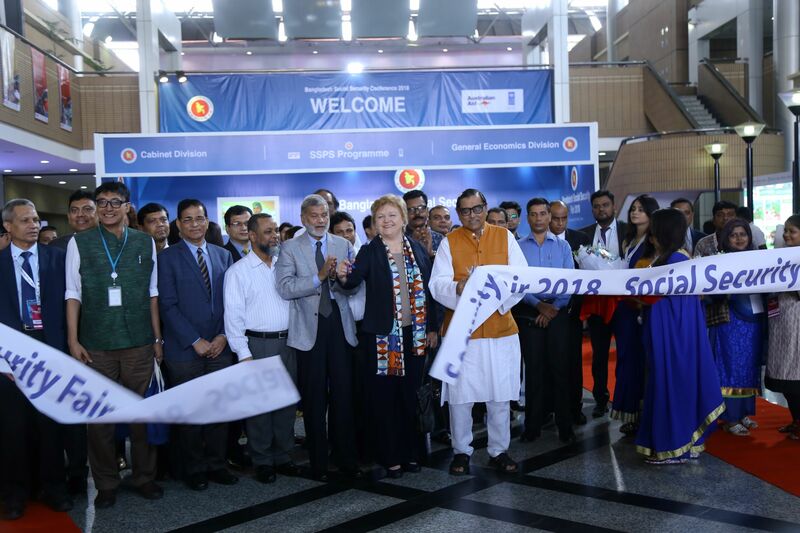 Simultaneously with the conference a Social Security Fair has been organized in the premises of the BICC where around 50 stalls were put up by social protection implementing ministries, NGOs and mobile banking companies. 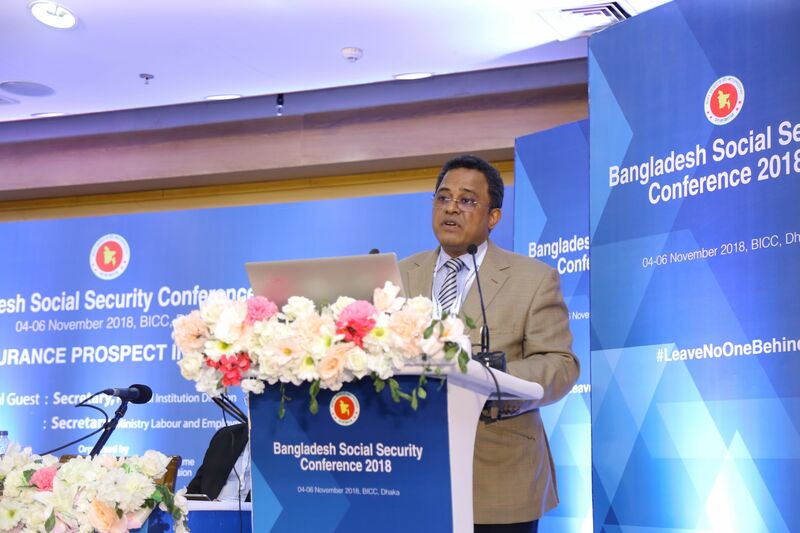 The Social Security Conference started with a welcome speech by Mr. A. K. Mohiuddin Ahmed, Additional Secretary (coordination) of the Cabinet Division. Followed by a brief presentation on National Social Security (NSSS) Action Plan by Mr. N M Zeaul Alam, Secretary (Coordination & Reforms), Cabinet Division. A second presentation was given by Dr. Shamsul Alam, Member (Senior Secretary), General Economics Division (GED) of Planning Commission where he gave a brief on NSSS and Background Research Papers. The Hon’ble State Minister Mr. M. A. Mannan remarked that his ministry has allocated sufficient budget for implementation of social protection programmes. The Hon’ble Social Welfare Minister commented that the Ministry of Social Welfare has been entrusted with the major task of establishing the lifecycle based social protection system and he reaffirmed his commitment to complete the assignment within stipulated time. He added that already his ministry has started strengthening its human resources to take the challenges of NSSS. 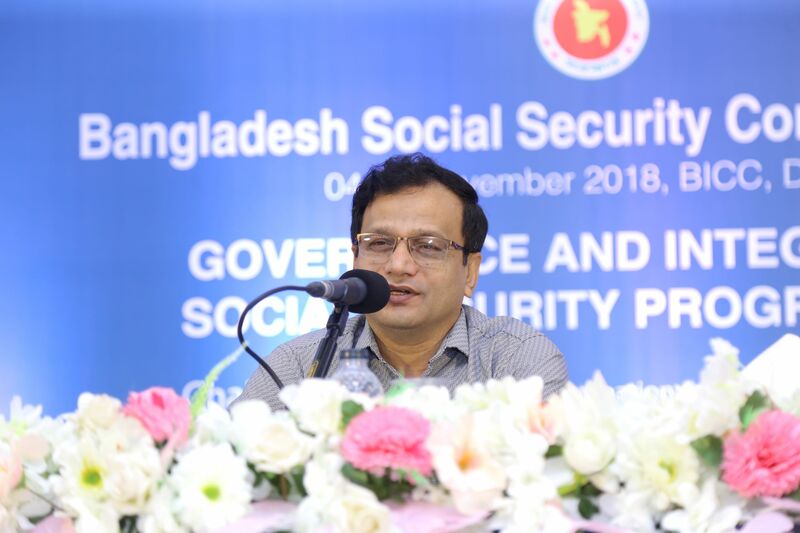 The Chair of the Conference Cabinet Secretary, Mr. Mohammad Shafiul Alam said NSSS has been formulated to provide a framework for life-cycle based social protection. It is developed to accelerate the process of social transformation. NSSS has come up with a mechanism for effective utilization of the resources allocated in this sector. He expressed his satisfaction on the formulation of action plan and stressed that the implementation will need support from all the govt. agencies, NGO, civil society members, and the political leaders. H.E. 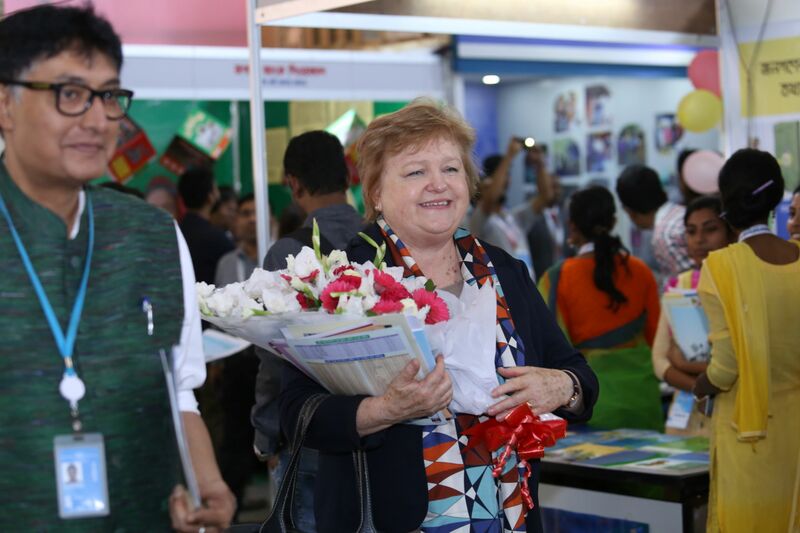 Ms. Julia Niblett, Australian High Commissioner in Bangladesh, Mr. Sudipto Mukerjee, Country Director, UNDP Bangladesh and Dr. Simone Field, UK Represenative of Bangladesh also spoke on this occasion. 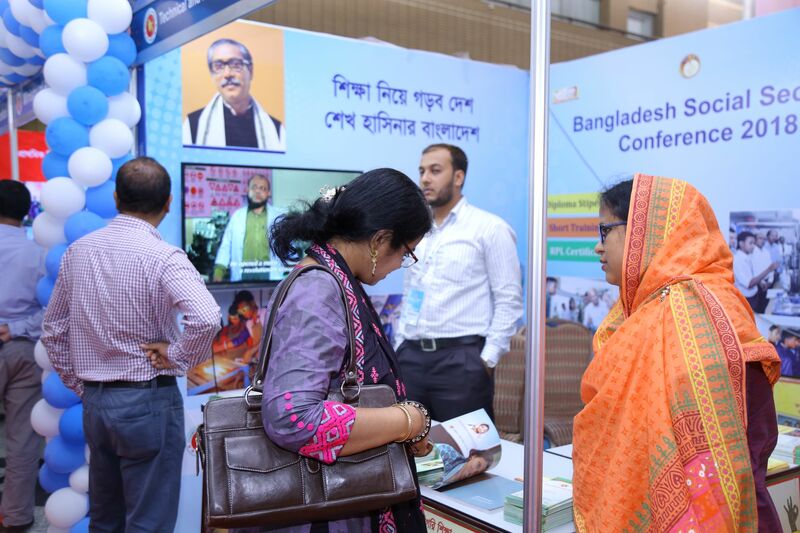 After the inauguration of the conference the honourable guests visited the stalls of the Fair which had the theme of innovation in delivery of social protection benefits and efficiency in designing the programmes. 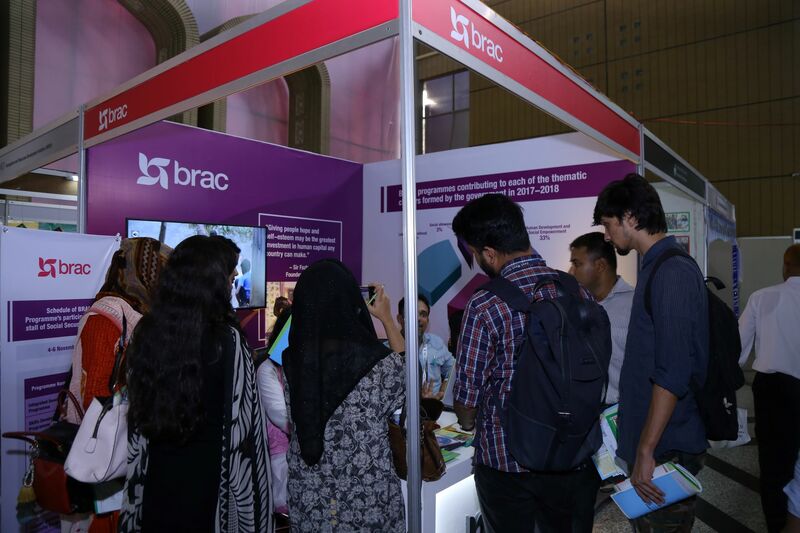 The fair was open for the public from 09.30 am to 05.30 pm for three days till 06 November 2018.
and Children Affairs, gave brief description about social security programmes of the ministry relating to social allowance. He highlighted the key achievements and success stories of programmes such as Maternity Allowance and Lactating Mother Allowance and touched upon ministry's vision towards Child Benefit Programme. 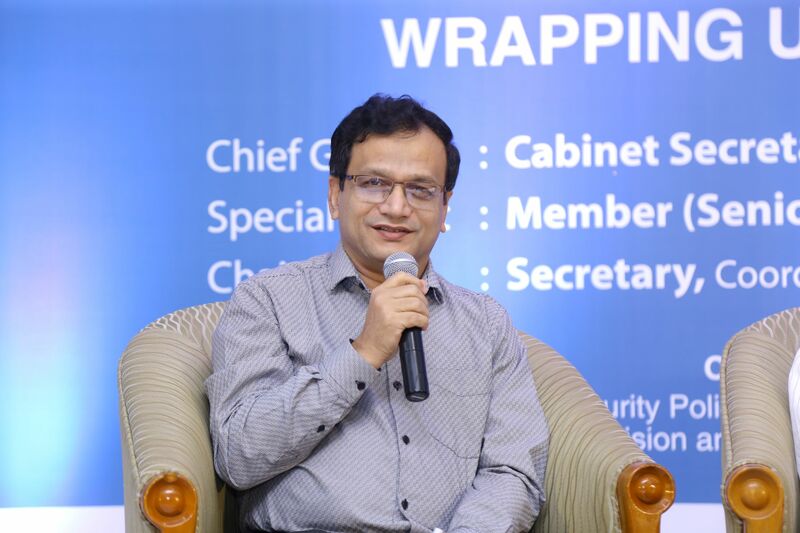 Mr. Dilip Kumar Banik, Joint Secretary, Ministry of Liberation War Affairs presented gave an overview of the ministry's flagship social security programmes Freedom Fighters’ Benefit Programme and Construction of House for Landless and Insolvent Freedom Fighters. He identified some of the challenges and explained the time bound activities by the ministry in order to implement the reform proposals of the NSSS. Ms. Sakeun Nahar Begum ndc, Additional Secretary, Ministry of Labour and Employment presented Elimination of Hazardous Child Labour project of the ministry. She gave a brief background of the project and touched upon the child labour scenario of the country. She mentioned the success stories and progress of the and explained how this project will contribute towards the achievement of NSSS's goals. 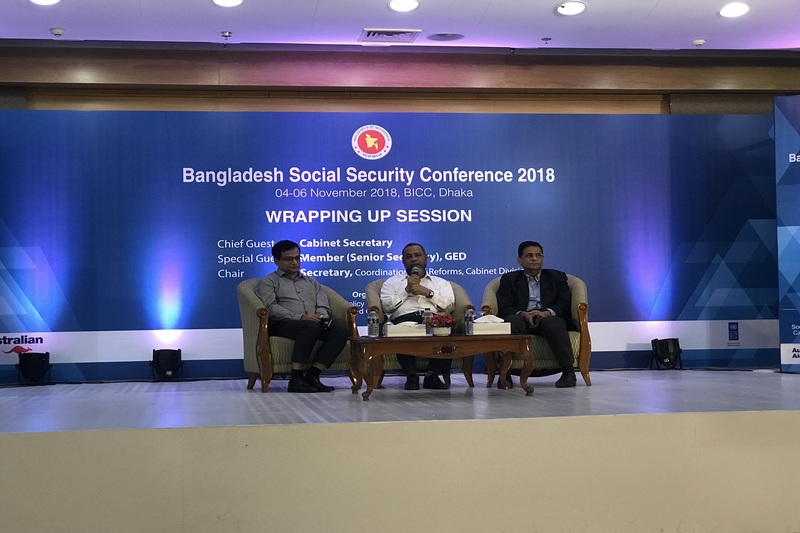 The next presentation was on the social security programmes of the Ministry of Chittagong Hill Tracts Affairs by the Additional Secretary of the ministry, Mr. Manik Lal Banik. He described ministry's social security related activities and gave brief overviews of the programmes including Food Security for Chittagong Hill Tracts People, Harmony and Development Programme, Cluster Village Programme for 25,997 Non-tribal families, Food Rehabilitation Programme for the listed members of the CHT Jana Samhati Samity (JSS), Rehabilitation Programme for Tribal Refugee families returned from India and Special Programmes. The last presentation of the day was by Md. Azizul Alam, Additional Secretary, Finance Division. the four-part presentation included the topics on Social Protection Programme Delivery, Payment to Beneficiaries; Programme Improvement - Management Information System (MIS), Diagnostic Studies and Reform Plans with aim to Consolidation and Capacity Development for Social Protection. 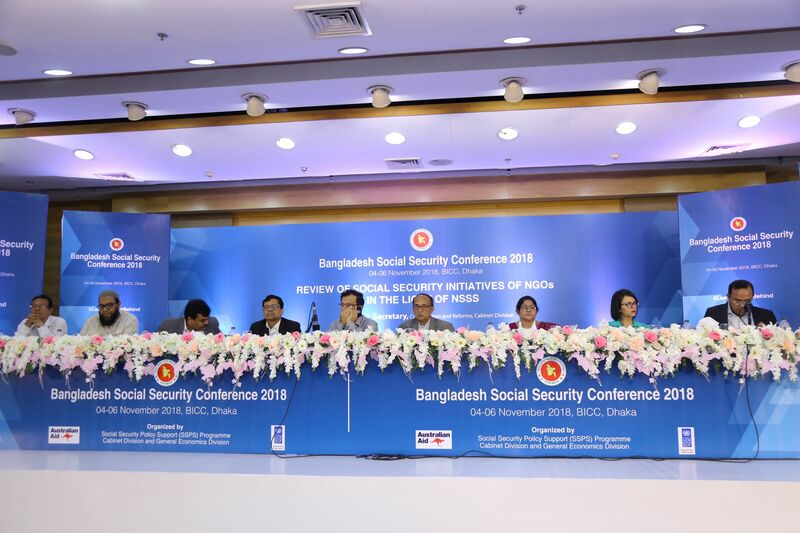 The proceedings of the second day of Bangladesh Social Security Conference 2018 continued as scheduled 5 November 2018 at the Carnival Hall of BICC. 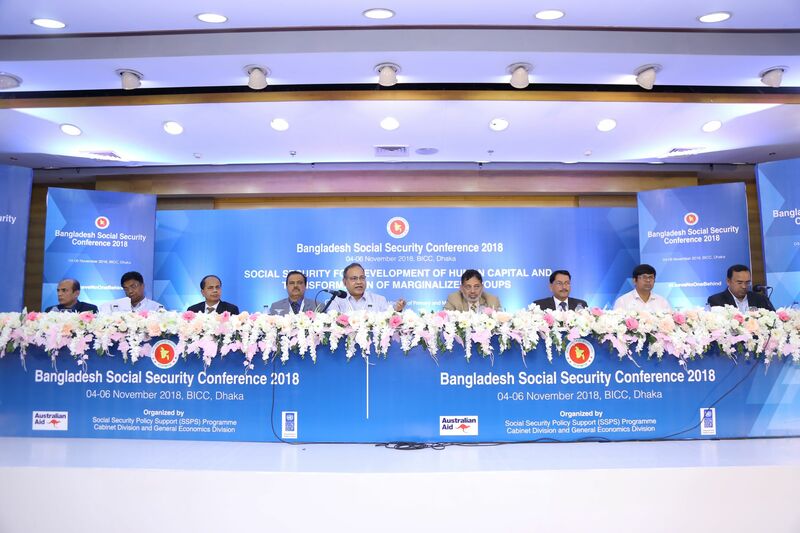 During the second day of the three-day long Conference, different ministries and divisions of the government of Bangladesh presented their social security related activities, visions and challenges. The activities of the second day started with a session titled ‘Food Security Preparedness and Efficiency in Emergency Response’ where six ministries of the government presented their activities related to food security, food quality, consumer rights, and disaster time protection. Mr. Shahabuddin Ahmad, Secretary, Ministry of Food presided over the session. The session began with a presentation from Most. 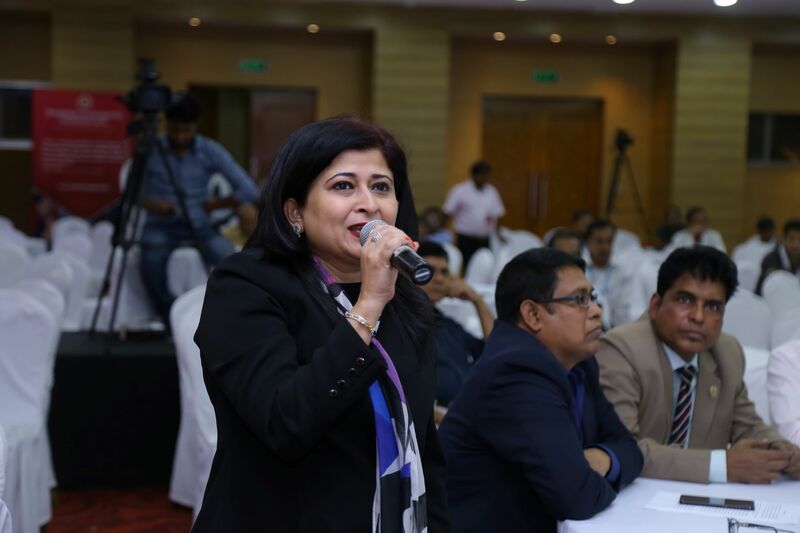 Kamrunnahar, Joint Secretary of Ministry of Commerce when she presented the ministry’s initiatives to control the price of essential commodities using its 14 efficient market monitoring teams. The presentation also focused on the issue of consumer rights. The Director (Relief) of Department of Disaster Management, Md. Iftekharul Islam introduced the audience with the measures the Department has in place to provide protection for the affected people. Mr. Md. 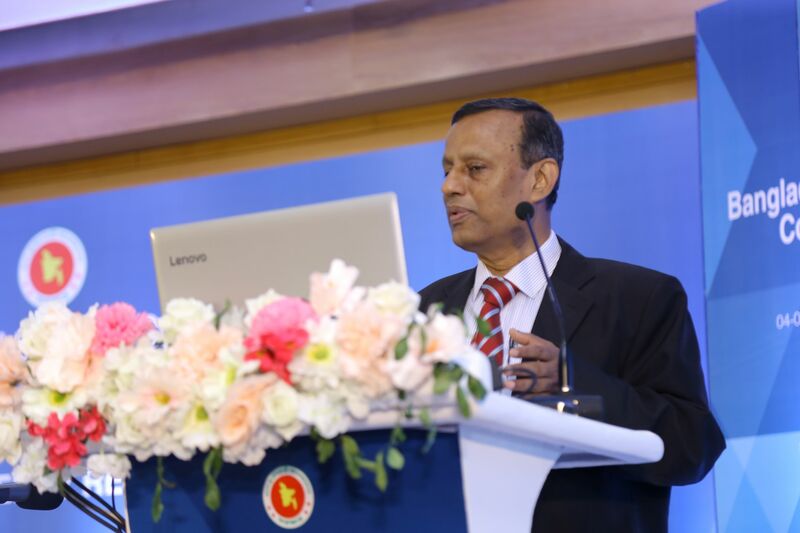 Arifur Rahman Apu, Director General (Additional Secretary) of Directorate General of Food presented Open Market Sales (OMS), Food Friendly Programme, Rice Fortification, Household silos, and other activities in operation under the Ministry of Food. Afterwards, Sirazul Haider NDC, Additional Secretary, Ministry of Agriculture presented the ministry’s achievements in increasing crop production, free distribution of seeds, distribution of cash as incentive and subsidy on fertilizers. Mr. Toufiqul Arif, Joint Secretary, Ministry of Fisheries and Livestock informed that his ministry is currently running 7 social protection projects. In addition to initiatives to increase fish production, the ministry is also trying to retrieve lost species of fishes. Md. Sazzadul Islam, Deputy Director of the Department of Social Services also ran a presentation. The session ended with a speech of the Chair. In the second session titled Social Security for the Development of Human Capital and Transformation of Marginalized Groups, the Ministry of Primary and Mass Education introduced the guests and participants with the four major projects it is currently working on. Two of these are Primary Education Stipend Projects and Reaching Out-of-School Children. It was followed by the representative of the Medical Education and Family Welfare Division where the audience was given a brief picture of successes in reducing maternal deaths, new-born deaths and other sectors. Mr. Mozaffar Ahmed, Additional Secretary of Ministry of Expatriates’ Welfare and Overseas Employment also ran a presentation. He mentioned that around 10.2 million Bangladeshi expatriates are employed in various counties of the world. Among them, 0.7 million expatriates are women. He discussed a number of projects the Ministry has in place to help and protect the Bangladeshi expatriates and to improve and expand the overseas employment of Bangladeshis. Mr. A.K.M. 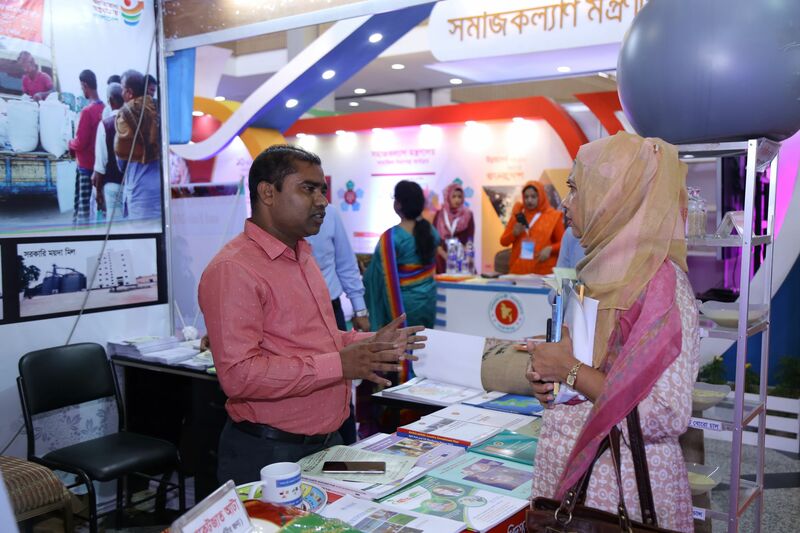 Zakir Hossain Bhuiyan, Additional Secretary, Technical and Madrasah Education Division, Ministry of Education, ran a presentation where he presented Skills and Training Enhancement Program (STEP). Mr. Bhuiyan also informed that currently a total of 135,631 students all over the country are under stipend. Ministry of Land presented two of its projects: Village Cluster project and Char Development project. Mr. MD. Abul Kashem, Deputy Director (VGD), Ministry of Women and Children Affairs discussed the transformation of Vulnerable Group Development activities over the years. 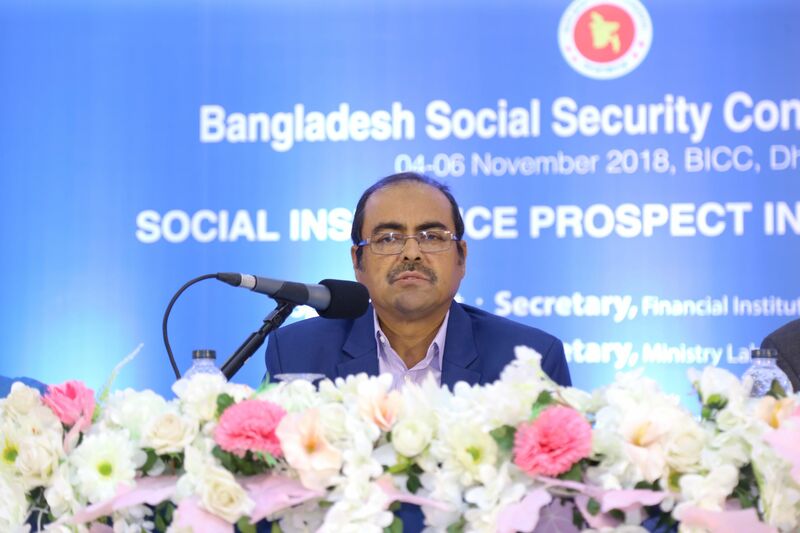 Mr. Kamruzzaman, Deputy Director, Department of Social Services, Ministry of Social Welfare then gave a presentation on related social security programmes by the ministry. Ministry of Labor and Employment displayed the wide range of protection and skill-enhancing projects it has in place, followed by a brief presentation from the Ministry of Youth and Sports on National Service Program (NSP). The last presenter of this session was Dr. Mohiuddin Osmani, Joint-Chief, Health Services Division where he discussed 10 projects under his ministry for the protection of people in need. 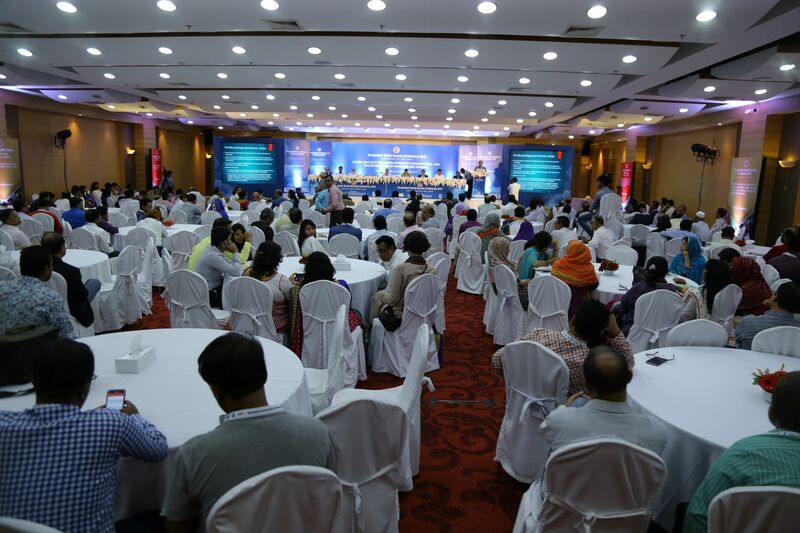 The third session of the event, Challenges and Prospects of Consolidating Workfare Programmes, focused on the issues of skill enhancement and income-generating activities for the poor. Mr. Zakir Hossain Akhanda, Additional Secretary of Ministry of Disaster Management and Relief ran a presentation where he presented the activities of Employment Generation Program for the Poorest (EGPP), a project that creates employment activities for the poorest people of the country for at least 80 days a year when scarcity of employment reaches its peak. Mr. Md. Emdad Ullah Miah, Joint Secretary of the Local Government Division, discussed the ongoing activities on the issues of climate change infrastructure, water resource management, health and nutrition, capacity building, women empowerment and engagement of private sector. 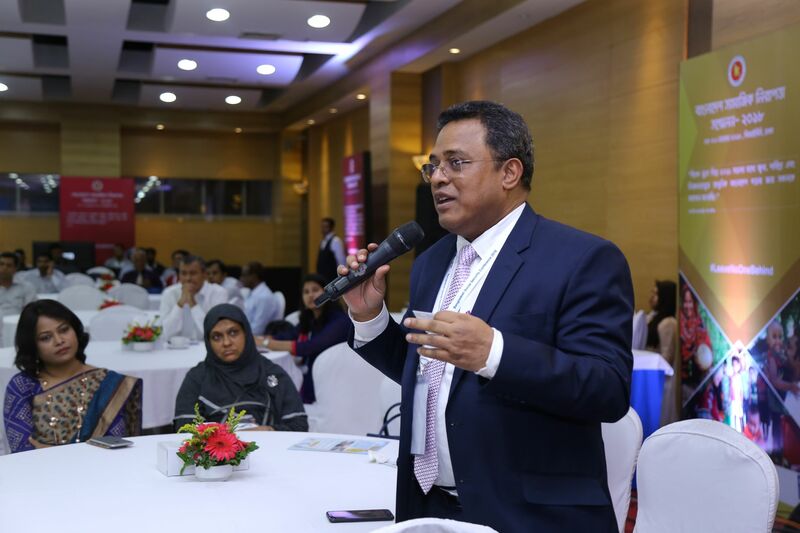 Dr. Ataur Rahman, joint secretary of Ministry of Women and Children Affairs, introduced the audience with skill-enhancing and micro-credit activities of the Ministry. He informed that at least 45,000 women have been given training in different sectors. It was followed by a brief presentation on Skills for Employment Investment Program (SEIP), a project under the Finance Division, Ministry of Finance. Rural Development and Cooperatives Division also ran a presentation where it focused on poverty alleviation through cooperative societies. According to the presentation, 3.90 million poor families under protection and 1.77 million family farms are in operation. Sakeun Nahar Begum, Additional Secretary, Ministry of Labor and Employment, discussed Northern Areas Reduction of Poverty (NARI) Project, a project that provided 8030 women with training and job for around 5000. Ministry of Water Resources discussed its flood management and livelihood improvement activities in Haor regions of the country. The Chair of the session, Mr. Md. Shah Kamal, Secretary, Ministry of Disaster Management and Relief, expressed his concern regarding the wages of the laborers in govt. projects and urged the relevant authorities to start one-stop services for the cooperative societies. 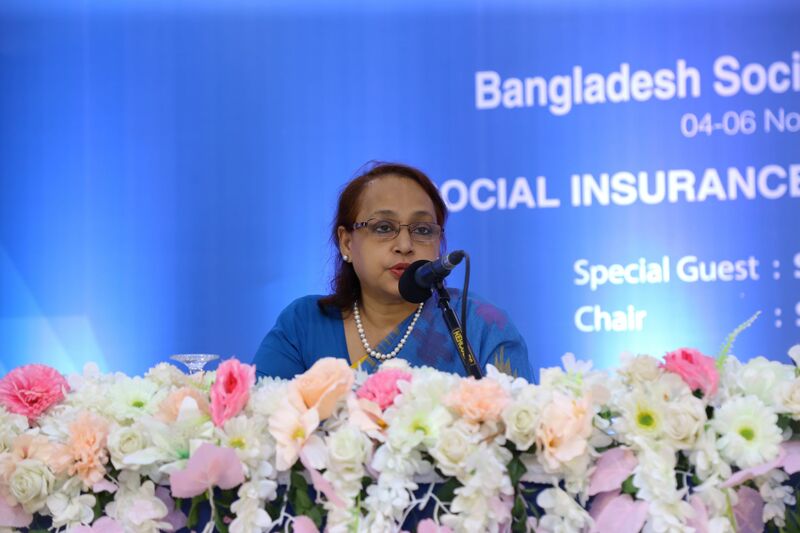 The fourth and last session of the day was on the issue of ‘Social Insurance Prospect in Bangladesh’. 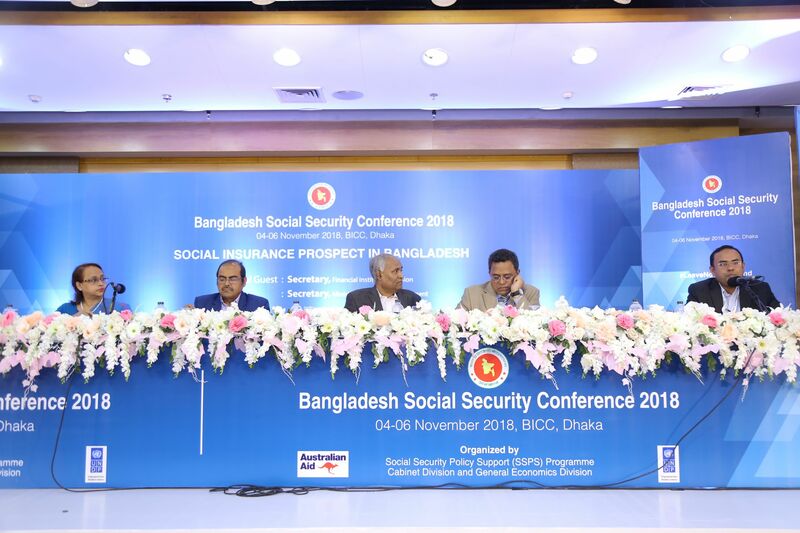 Mr. Aminul Arifeen, National Project Manager, Social Security Policy Support (SSPS) program presented the context and a brief idea of social insurance in Bangladesh. In his presentation, he mentioned that social protection is a constitutional obligation and a social contract between the state and its citizens. He also presented a comparative picture of existing social insurance system in different countries. As per his presentation, social protection and insurance is a must to ensure financial inclusion for all. He emphasized on the govt.’s role in being the last resort for the poorest in providing loans and other assistance without collateral. Discussants include Mr. Md. 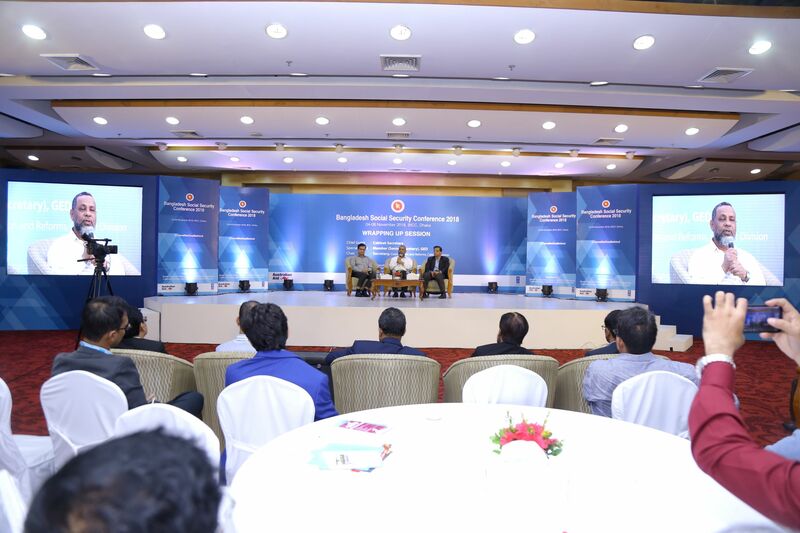 Ashadul Islam, Secretary, Financial Institutions Division, Ministry of Finance and Mr. Gokul Chand Das, Member, Insurance Development and Regulatory Authority (IDRA). 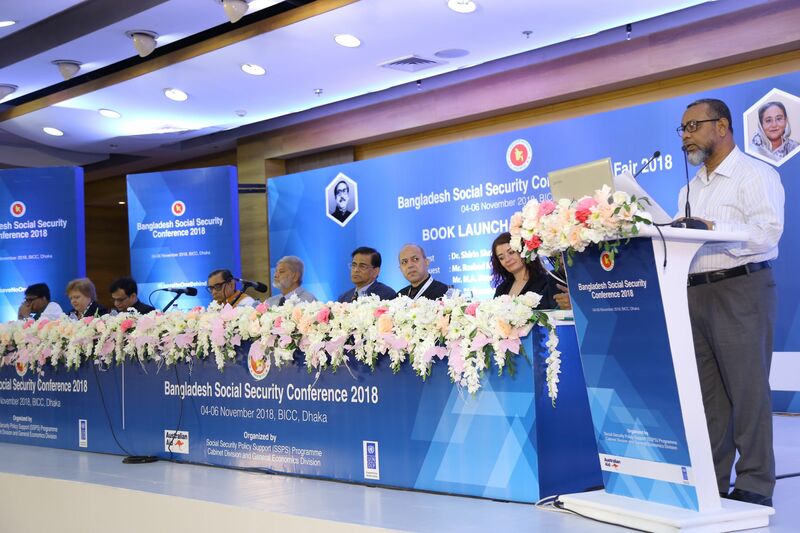 The proceedings of the third and last day of Banglahdesh Social Security Conference 2018 was held as scheduled today (6 November 2018) at the Carnival Hall of Bangabandhu International Conference Centre. During the last day of the three-day long Conference, different autonomous govt. 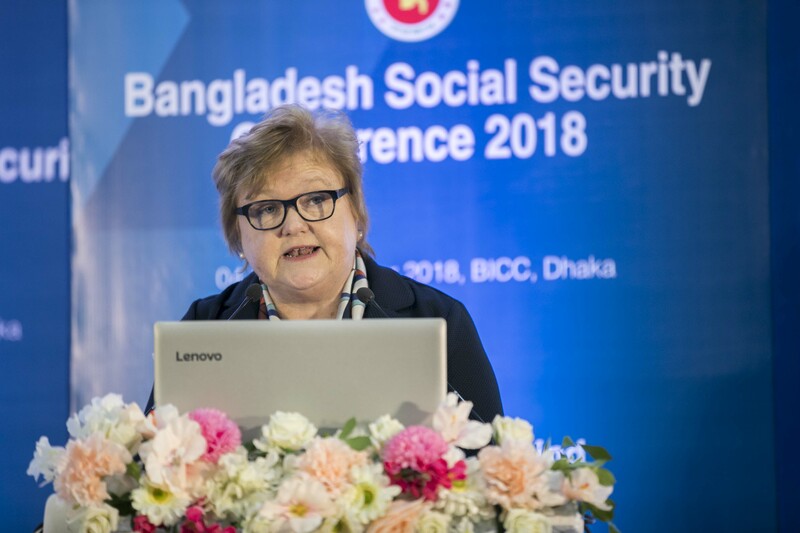 organizations, non-government development organizations, and financial institutions (banks and mobile financial services) presented their social security related activities, visions and challenges. 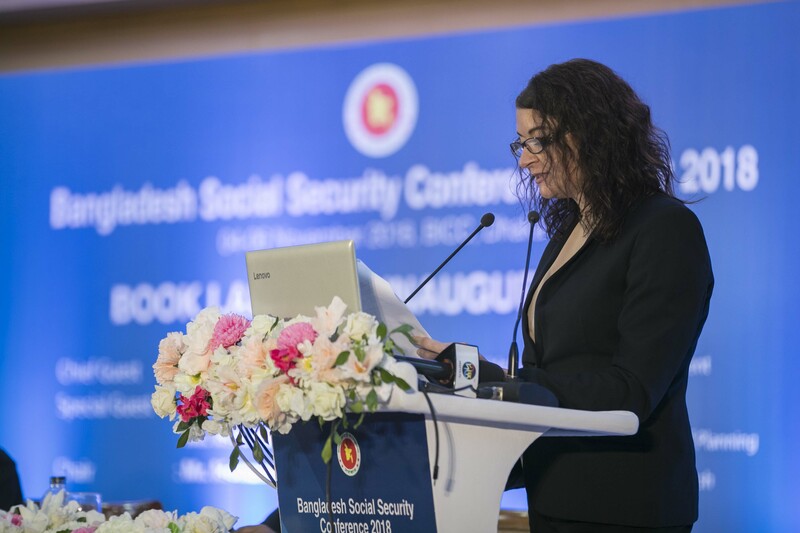 Different international NGOs also gave the audience a brief view of their contributions in social security. 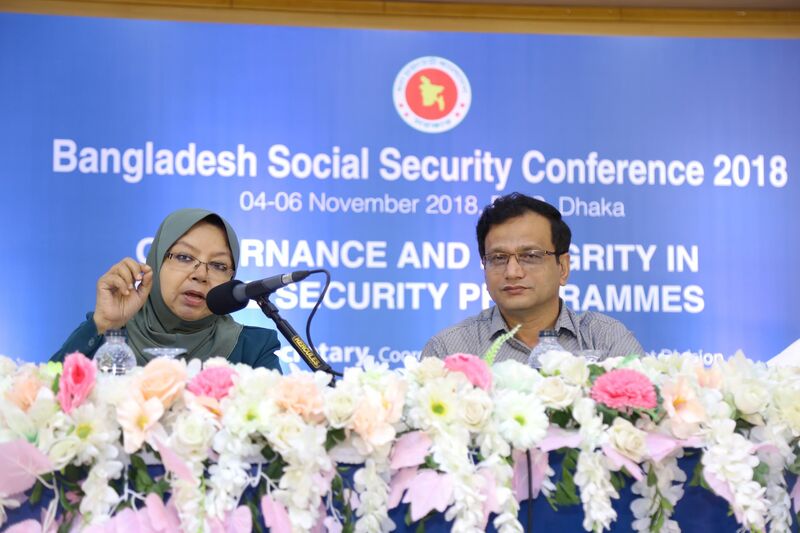 The activities of the third day of the Conference started with a session titled, ‘Governance and Integrity in Social Security Programmes’ where speakers focused on the role of good governance and integrity in strengthening the effectiveness of social security measures. Mr. N M Zeaul Alam, Secretary (coordination and reforms), Cabinet Division presided over this session. 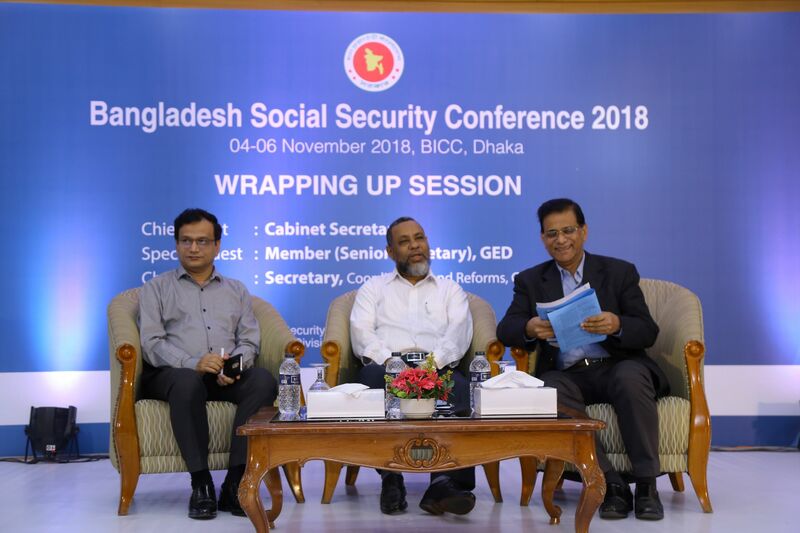 Social Security Specialist Mr. Mohammad Khaled Hasan, Deputy Secretary, Cabinet Division, ran a presentation in this session in which he discussed the concept of good governance and integrity and their immense relevance in social security strategy. Mr. Hasan presented different aspects of National Integrity Strategy as the Bangladeshi model of good governance and corruption prevention. He also highlighted the progress in the formation of an Integrated MIS to address the issues of registration, delivery of govt. assistance, and Grievance Redress System (GRS) for the beneficiaries of social security measures. Mr. Hasan also informed that the existing grievance redress system lets anyone to submit complaints regarding the services through online and offline. The presentation also focused on the Government and donor organization initiatives to align National Social Security Strategy with Sustainable Development Goals (particularly Goal-1 and Goal-16). The presentation was followed by a brief question-and-answer session. Ms. Nasima Begum, NDC, Secretary, Ministry of Women and Children’s Affairs also blessed this session with her presence. The following session of the event was titled ‘Review of Social Security Initiatives of NGOs in the Light of NSSS’ where NGOs and autonomous govt. 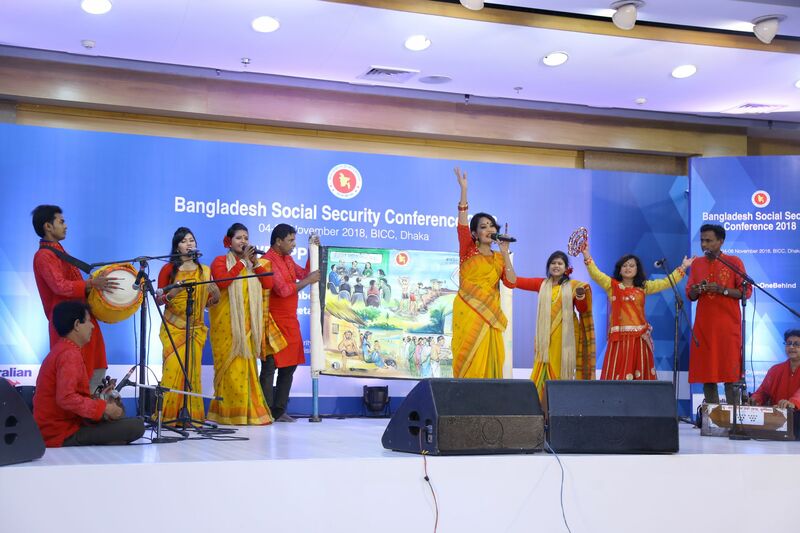 organizations showcased their activities relevant to the National Social Security Strategy. The session began with a brief presentation from Bangladesh Nari Pragati Sangha-BNPS. The organization highlighted three of its many projects that directly contribute to social security of marginalized people. 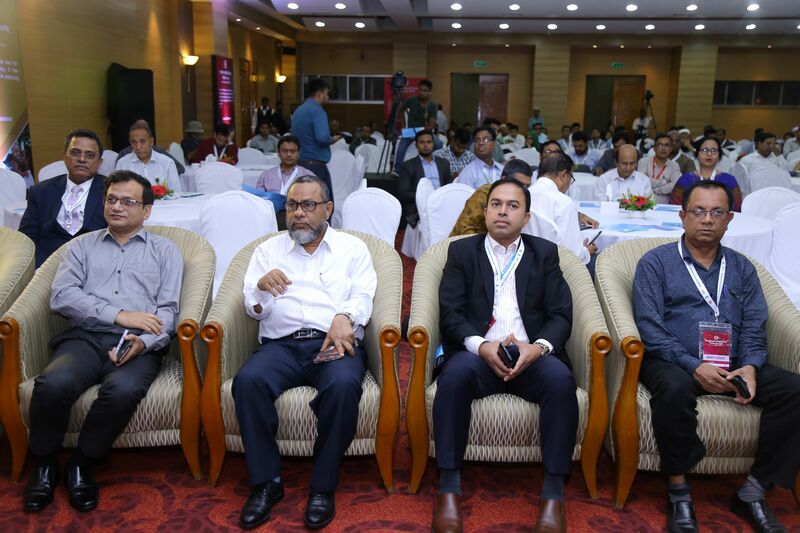 Dr. Sharif Ahmed Chowdhury, General Manager, Palli Karma Sahayak Foundation (PKSF) introduced the participants with eight ongoing programs of the autonomous govt. organization that encompasses sectors like beggar rehabilitation, economic development of Dalit people, stipend for the children of marginalized families, skill development activities for disabled people and others. He also informed that PKSF is currently working with more than 200 partner organizations all over the country. Non-governmental development organization Shushilan introduced the audience with five of its social security programs. Mr. Sarder Akhter Hamed, Senior Executive Vice President of Bank Asia focused on the Bank’s association in social security mechanism. He said that his bank is currently working to deliver the govt. allowance and other assistance directly to the beneficiaries, eliminating the intermediaries and other hassles. 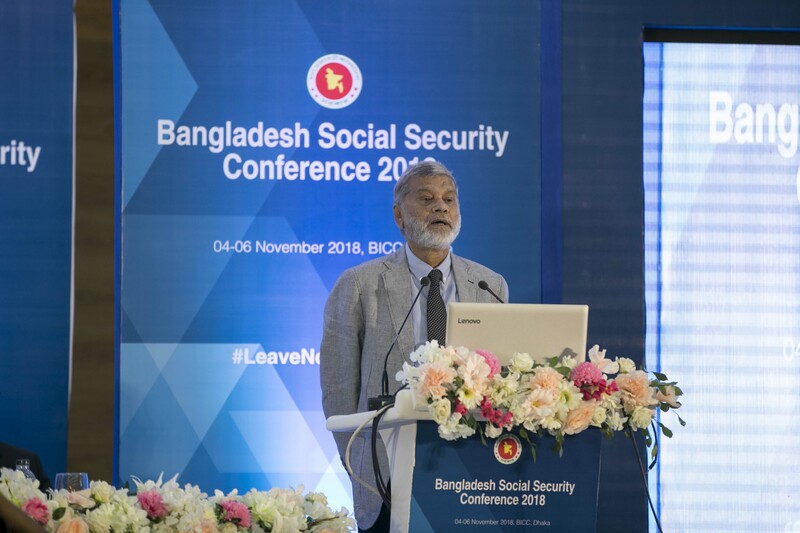 Mr. Mazedul Islam of BRAC’s Policy Research and Evidence Team informed that BRAC has spent more tham BDT 1239 crore in social protection activities. The activities included human resources development, social insurance, food security, labor and livelihood etc. He emphasized on giving NGOs enough recognition for their contribution. 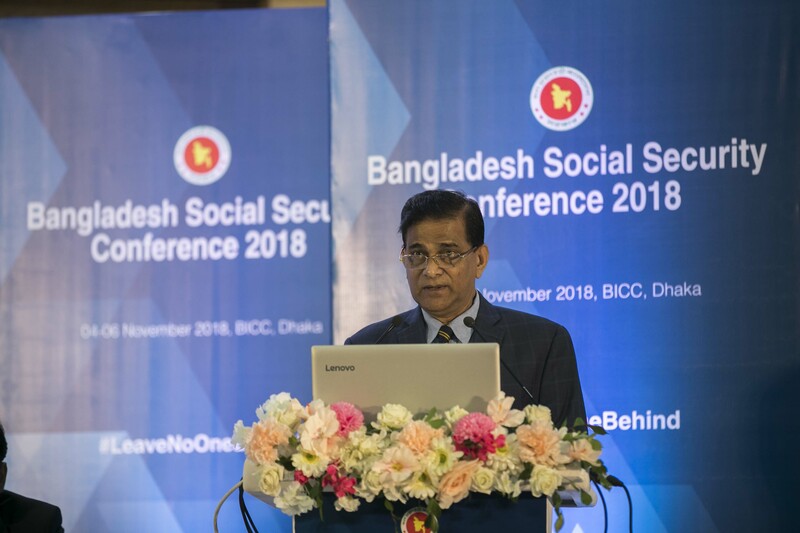 Mr. Abu Hasnat Chowdhury, Director of Non-profit organization Association for Social Advancement (ASA), in his presentation, informed that more than 7 million families of the country is now associated with ASA. Their activities include Primary Education Strengthening Program (PESP), health services, clean water and sustainable sanitation, financial facilities for treatment and others. Mr. Ziaul Karim, on behalf of Manusher Jonno Foundation, expressed the organization’s commitment towards delivering the needs of grassroots people to policy making level. The representative from Action Aid Bangladesh informed the audience of the organization’s activity in developing climate change resilient sustainable agriculture, establishing pro-farmer market value chain, ensuring poor people’s access to land and other resources, Community Based Disaster Preparedness (CBDP), livelihood promotion of poor during emergency etc. It was followed by a presentation from Management and Resources Development Initiatives (MRDI) where the organization displayed its activities to link corporate social responsibilities (CSR) activities with sustainable development goals for a more meaningful impact. International humanitarian organization World Vision presented its project ‘Nobo Jatra – New Beginning’ that focuses on the health, food security and nutrition of marginalized people and has over 856000 beneficiaries in two southern coastal districts of the country. 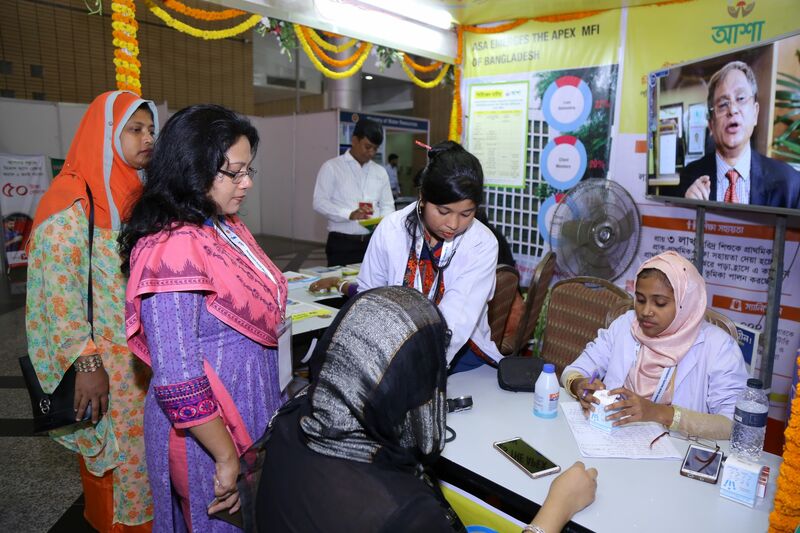 Ms. Aklima Khatun of Gana Swasthya Kendra informed that the organization is running 43 health centers in 20 districts of the country. 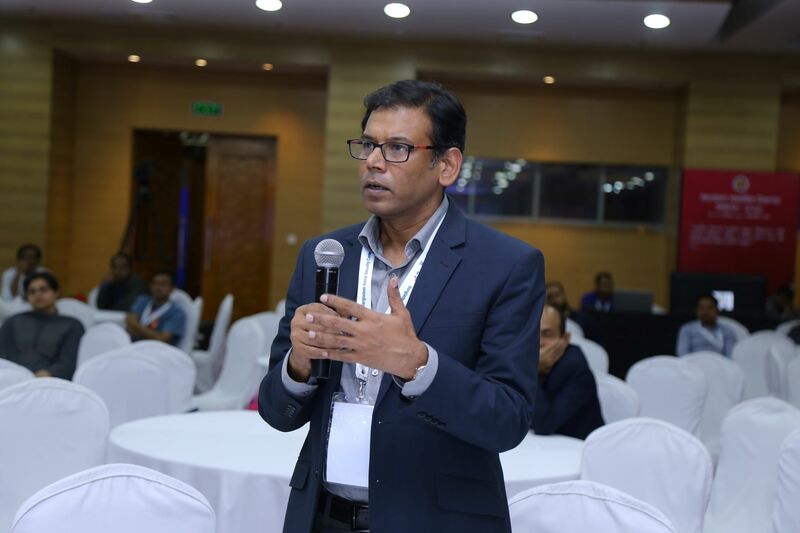 Mr. Saifuddin Ahmed, Advisor, CARE Bangladesh informed that his organization has spent more than BDT 147 cr. in social security programs. Mr. Swapan Kumar Sutradhar, on behalf of Save the Childen, informed that the organization is working with local govt. bodies to bring sustainable changes in child-sensitive norms in the country. Mobile financial services Bkash, Rocket and SureCash also presented their roles in disbursing the money directly to the beneficiaries without any intermediaries. Representatives from the above-mentioned services highlighted their roles in preventing corruption, ensuring transparency and strengthening the effectiveness of social security strategy. The three-day long cultural program ended with a delightful cultural program where Shushilan Sangskritik Dal (Khulna) staged a pictorial drama on different social security measures of the govt. 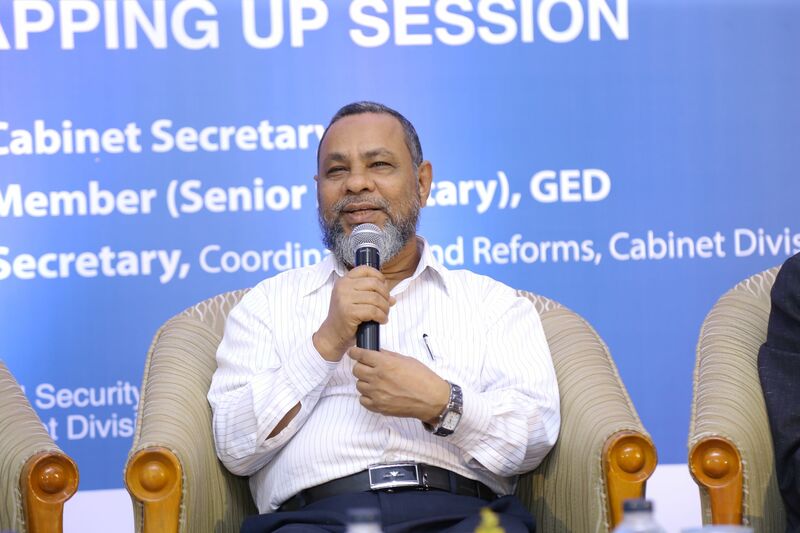 The wrapping up session was chaired by Mr. N M Zeaul Alam, Secretary (coordination and reforms), and Cabinet Division. The chief guest of the ceremony was the Hon. Cabinet Secretary, Mohammad Shafiul Alam. Dr. Shamsul Alam, Senior Secretary, General Economic Division (GED), Planning Commission was present as the special guest. 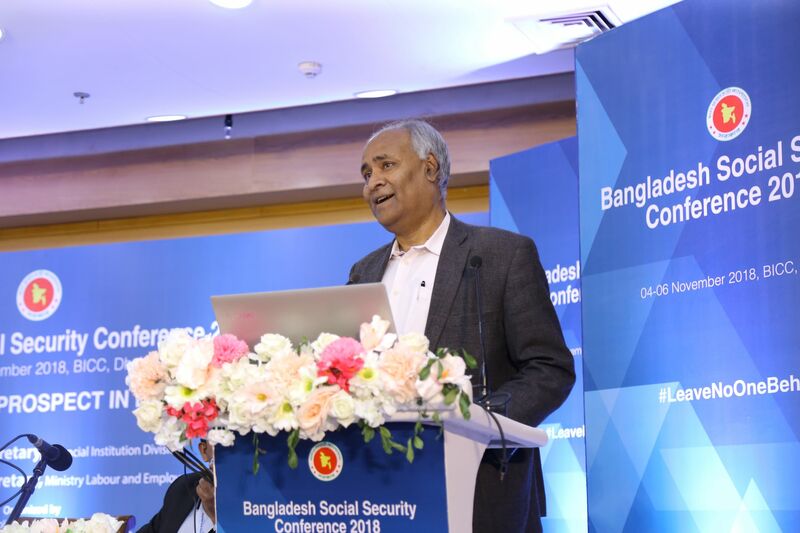 In his speech as the special guest of the event, Dr. Shamsul Alam said, the National Social Security Strategy is a wonderful document. The implementation process is also progressing quite well. The partnership and cooperation we have seen between the govt. bodies and non-govt. organizations will remain as an inspiring example of public-private partnership. This seminar is an important step in transforming Bangladesh into a welfare state. 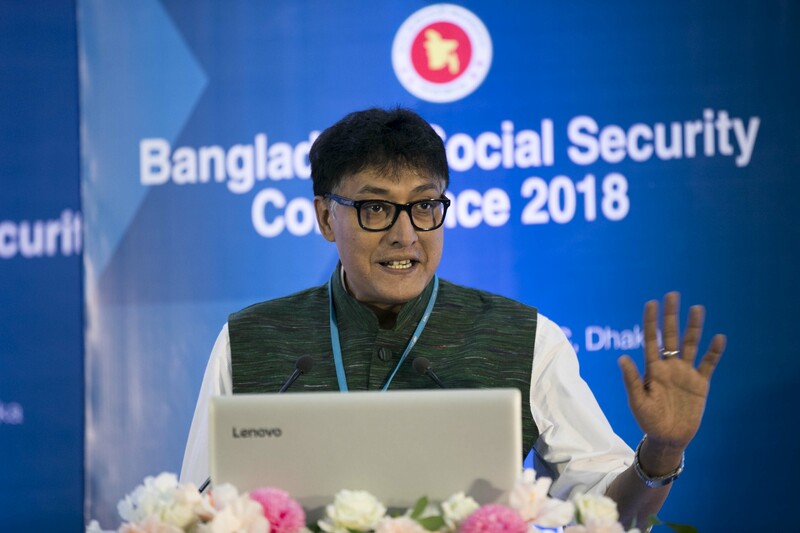 Mr. Shafiul Alam, as the chief guest, said, the documentation of National Social Security Strategy is undoubtedly praiseworthy. Still some constraints are still lagging the implementation behind. He also pointed towards the future of this mammoth task, saying, ‘We will prepare a comprehensive database where all the beneficiaries will be brought under one umbrella. 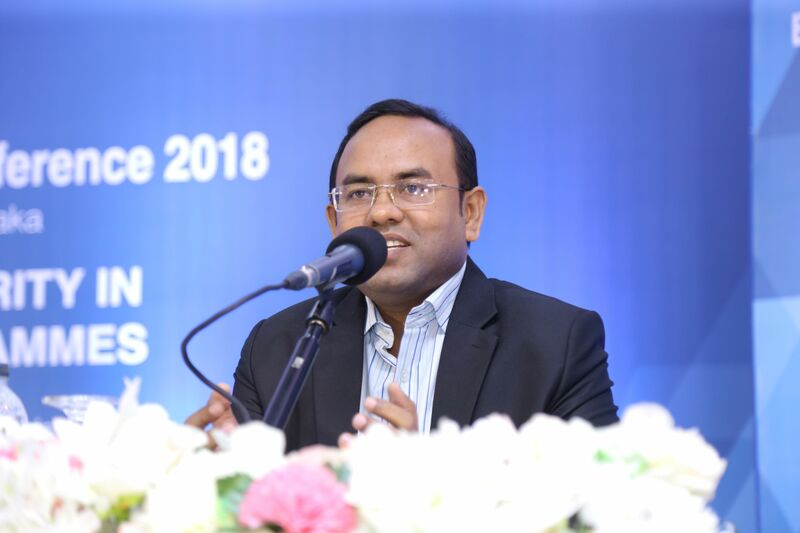 In this way, we can also stop some beneficiaries using two protection benefits at the same time.’ In his speech as the chair of the ceremony, Mr. Zeaul Alam thanked the chief guest, the special guest, govt. ministries and NGOs for their wholehearted cooperation to make the three-day ceremony a success. He also said that the success of this event will inspire the future initiatives in this sector. 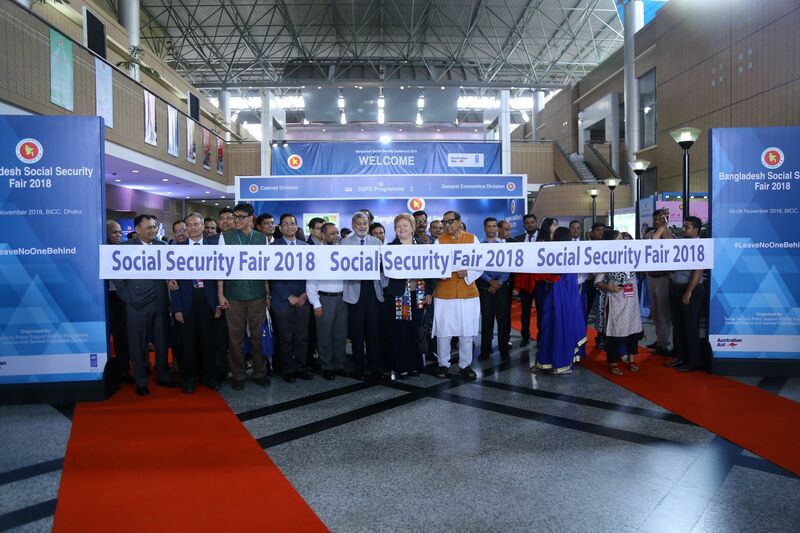 National Social Security Fair was also inaugurated after launching programme at the premises of the launching venue on the first day of the event. 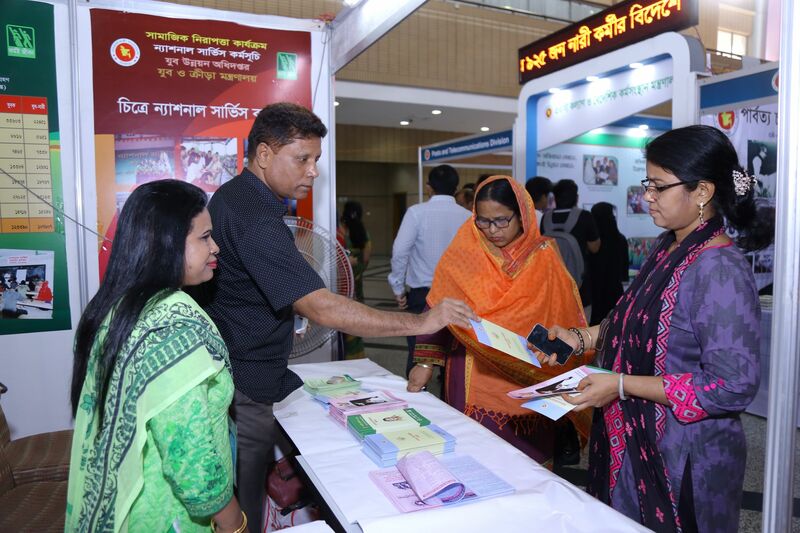 Social security programme implementing ministries and leading NGOs in similar field took part in three day-long social protection fair. 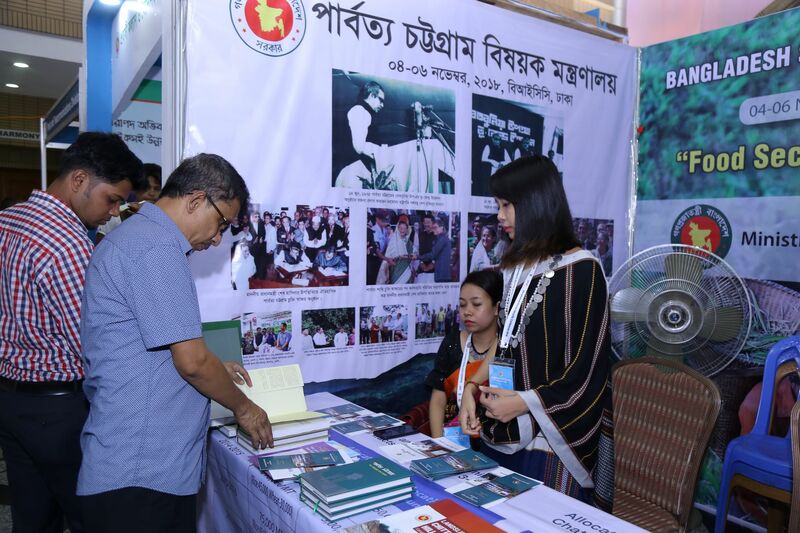 The participating ministries and organizations showcased their flagship programmes in social protection by use of banners, placard, audio-visuals etc. 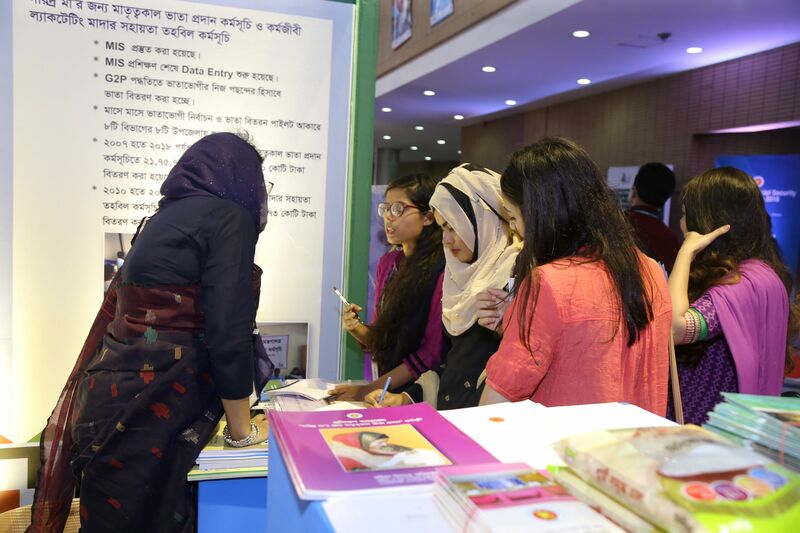 The fair was participated by Cabinet Division, General Economics Division, Social Security Policy Support (SSPS) Programme, Ministry of Food, Ministry of Disaster Management and Relief, ICT Division, Ministry of Social Welfare, Ministry of Liberation War Affairs, Ministry of Industries, Ministry of Women and Children Affairs, Ministry of Education, Ministry of Primary and Mass Education, Ministry of Youth and Sports, Ministry of Commerce, Ministry of Health and Family Welfare, Ministry of Chittagong Hill Tracts Affairs, Ministry of Expatriates' Welfare and Overseas Employment, Posts and Telecommunications Division, Finance Division, Financial Institutions Division, Ministry of Labour and Employment, Local Government Division, Ministry of Agriculture, Ministry of Fisheries and Livestock, Ministry of Land, Rural Development and Co-operatives Division, Palli Karma Sahayak Foundation, Ganashasthaya Kendra, Bangladesh Nari Progati Sangha (BNSP), BRAC, ASA, Save the Children, Management and Resources Development Initiative (MRDI), Thengamara Mohila Sabuj Sangha (TMSS), Manusher Jonno Foundation (MJF), Rocket, bKash, Bank Asia, SureCash.